No. 10, Jalan Setia 4/6, Taman Setia Indah, 81100 Johor Bahru, Johor, Malaysia. No. 11, Jalan TPK 1/9, Taman Perindustrian Kinrara, 47100 Puchong, Selangor, Malaysia. 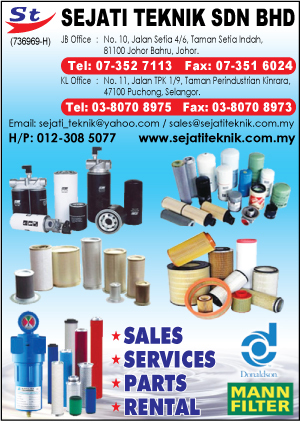 SEJATI TEKNIK SDN BHD was provides specialized technical services and related support for the upkeep and sustaining effective operation of compressed air equipment so essential for industrial applications in manufacturing plant facilities. 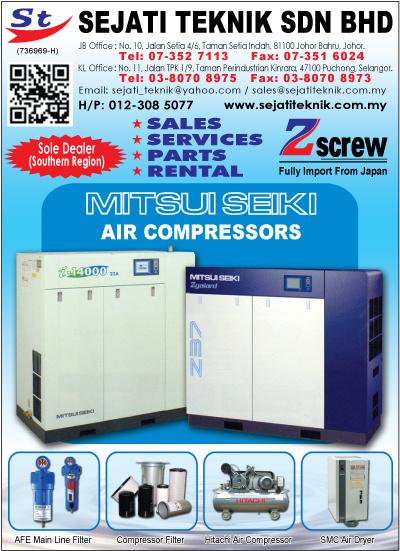 The principal activity of the company is to provide periodic preventive maintenance for all types of MITSUI SEIKI Air Compressors, the smallest scroll types, and Z screw types, Oil Free types & Oil Flooded types Air Compressors up to 300 HP capacity most normally engaged by most factories.As a trained service provider for such equipment, it is also our business to be engaged in the marketing and distribution of established brand of Air Compressor and to provide after-sales service and support such as trained service technicians, spare parts, and other related expectation to provide necessary assistance to our customer. Our scope of supply also include auxiliary equipment related to the whole compressed air system such as Air Dryers, Filtration of compressed air required , as well as installation of compressed air piping system for centralized/multi compressor station installation of electrical cabling to supply power to such equipment. As customer oriented service provider, you can count on us to keep your compressed air system trouble-free whilst prolonging the service life of the air compressor to continue to perform efficiently for many years when maintained well. Any enquiries for Air Compressor with capacities ranging from a 2HP to 300HP for your industrial application are most welcomed. Free consultation shall be extended to your enquiries to provide you and ideal solution. We look forward to work with you, and assure you of our best attention at all times.